EPPR works with the UMass Amherst School of Public Health to determine the effects of legalized gambling in the state of Massachusetts. Report for MassEcon says large majority of businesses that chose Massachusetts would do so again. The Economic & Public Policy Research group (EPPR) provides unbiased analyses on economic, demographic, workforce, and other public policy issues in Massachusetts, New England, and beyond. As a leading provider of applied economic and public policy research, we help our clients make informed decisions about strategic policy, planning, and investment issues. We produce in-depth studies that help clients build credibility, quantify impacts, gain visibility, educate constituents, prioritize investment, and plan economic development initiatives. EPPR’s client-driven project assignments are supplemented and supported by long-term roles tracking the economic and demographic trends in Massachusetts and New England. For example, as the official State Data Center we have unparalleled economic and demographic data experience and expertise in Massachusetts, including all US Census data products. 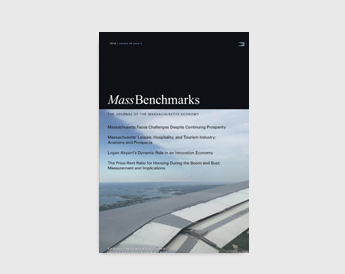 We also lead MassBenchmarks, an economic journal that presents timely information concerning the performance of and prospects for the Massachusetts economy, including economic analyses of key industries that make up the economic base of the state. Our affiliation with the University of Massachusetts positions us to tap into resources and expertise from the five-campus University system to promote the public’s understanding of critical economic and policy issues. Watch our 3-minute overvew video about our services. Read the latest issue of the MassBenchmarks economic journal.